Medicine bottle; a green bottle, moulded in two halves. Square-shaped with arched recesses on each face. Embossed on each recess: "Walbridge Co, Dunsmuir Cal, Cathedral Brand, Celebrated Remedy, Chief Wahoo, Electr G. Tonic". I have a 3" tall deep ruby red bottle. Same imperfections and embossing as described in previous comments. Can't remember how I obtained it...but I know I've had it since 1970. 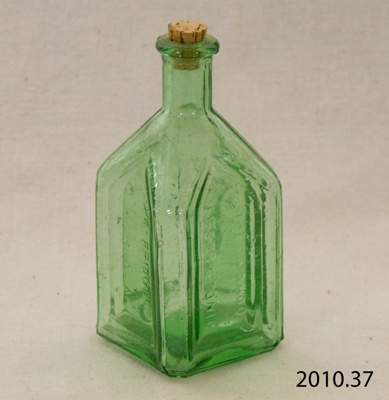 I inherited one of these little green bottles from my beloved in-laws here in Australia. Mine has the "MADE IN TAIWAN" embossing in the glass on the base, and rather than the side embossing of "ELECT G. TONIC" as noted in "Inscription and Marks", mine very clearly says "ELECTRIC TONIC" so perhaps the 'EIECTR G TONIC'/'ELECT G. TONIC' inscription listed above was an imperfect stamping in the making of that example. I have the same bottle but it's a much deeper, richer green color and it doesn't say "Made in Taiwan" on the bottom. It has just a small, round indention on the bottom as a marker. I was surprised to the "Made in Taiwan" marker on this bottle, but it's still beautiful. Wouldn't the "made in taiwan" embossed on the bottom indicate these are mass made in the not that distant past? I wanted to know how old these bottle are, we have two more in the color of yellow. Do you know how much they're worth.